Flash AV Soft Corp has a commercial video player component based on FFMPEG for it’s decoding and playback. The component has a lot of different features include a bunch of video filters which are probably something the normal Android video player component doesn’t offer. It also offers the ability to play back multiple videos at the same time in addition to all of the different sources it will accept to play video from. It can play video from a file, from a stream, from mms, and more. 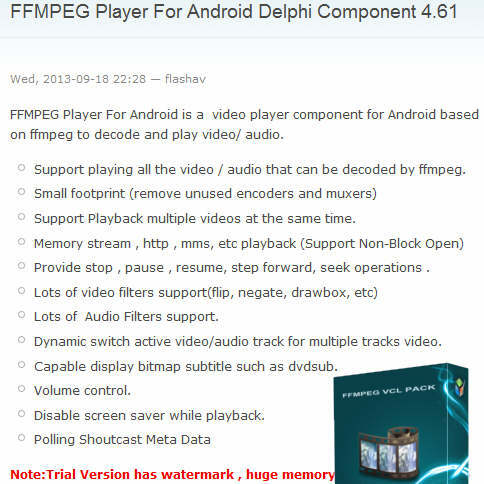 This component looks like a pretty good feature set and possibly a must have component for Delphi Firemonkey on Android if you need more than just playing a video file from the file system. There is a second version of the component that works on IOS. Head over and download the free trial of the FFMPEG video player component.